In a day full of merchandise news, such as the KINGDOM HEARTS Series 3D Foam Set from Monogram to the Static Arts Mini collection confirmed for a North American release, another piece of merchandise has popped up for Western shores. 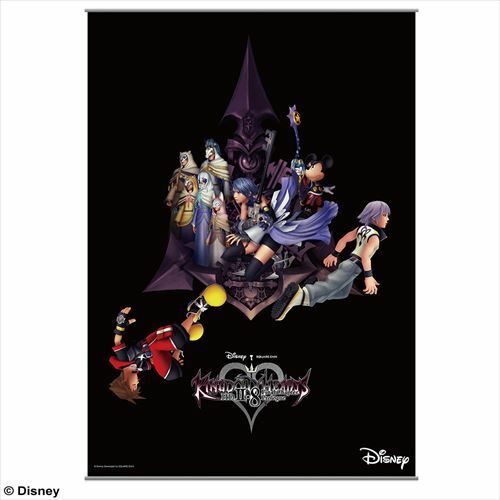 According to PREVIEWSworld, the KINGDOM HEARTS HD II.8 Final Chapter Prologue wall scroll will be available from October 26th 2016 for $29.99. There is currently no confirmation on where this will be sold, however we will keep you update with the latest news. KINGDOM HEARTS HD II.8 Final Chapter Prologue releases January 12th 2017 in Japan and January 24th 2017 for the rest of the world on Playstation 4. The collection contains Kingdom Hearts Dream Drop Distance HD, Kingdom Hearts 0.2 Birth by Sleep - A Fragmentary Passage -, and KINGDOM HEARTS χ [chi] Back Cover HD Cinematics. The scroll is also available for preorder from the Japanese Square Enix store for ‎¥2,880. 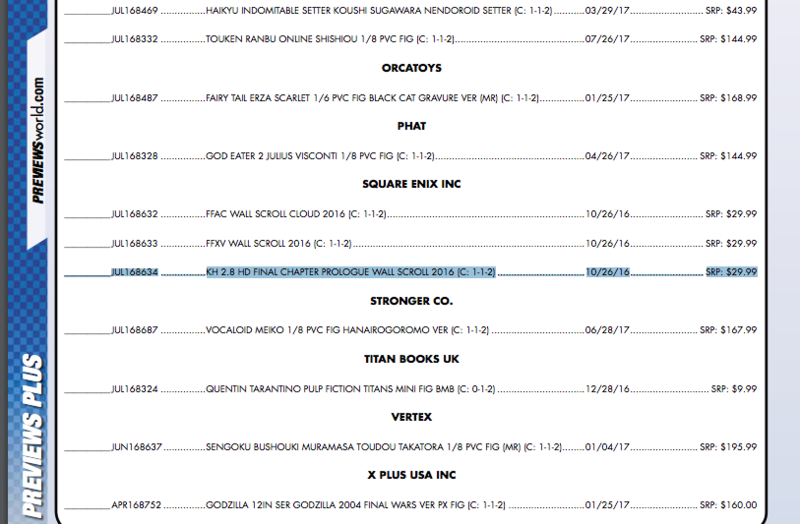 It will release on October 8th 2016. I hope it sells well and they'll make a second one, with the 2.8 cover art. That I would really consider buying. Nooo... I hope they'll release another one (the cover plsss). Got excited because I thought it was the cover art poster. Now I"m a bit dissapointed... It looks nice I guess, I just never liked 3D Game Models on a poster in my room, I prefer it hand drawn. On another note, Master Ava is really small compared to the other Masters. In the trailer she didn't look that small compared to the rest, right? It's mostly the way they've been placed there, Ava is much lower than the others, and all of them are placed a bit weirdly in relation to each other. She would be around the same height as Gula if she was standing on the same level. It does look a bit funny and isn't the best possible way to do it. ...Well this was a wasted investment. Couldn't Square Enix just CG the cover of 2.8? Well, that poster is not really my style sadly. Would have loved if it had been the box art of 2.8 since I really like that art in it. This really is just tragic to look at. Like some high-school intern copy and pasted all the renders on a black background and DONE! I have to agree, sadly. I mean, we don't know how long it took them, but it just... doesn't look all that good to me.